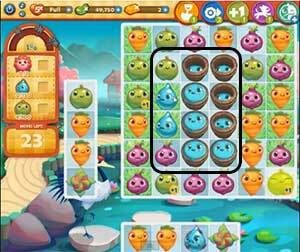 These Farm Heroes level 222 cheats and tips will help you beat level 222 of Farm Heroes. 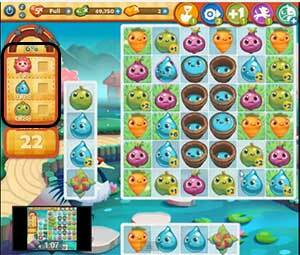 The objective of Farm Heroes level 222 is to collect 2 flowers, 150 droplets, and 100 apples in 25 moves. There are 8 buckets of water right in the middle of the board. You need to make matches right next to them to fill them up and produce water. This is very important because of the amount of droplets you need to collect as well as the flowers. The two flower buds are in a very hard place to make matches next to because they are in isolated rows. 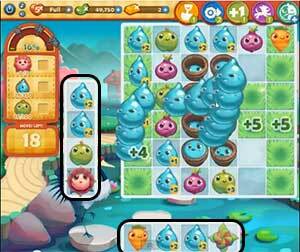 You can use a shovel to unfurl them or you can make the water droplets jump into the rows. If you keep making water, they droplets will eventually jump into the rows with the flowers and when three lineup, it makes a match and starts making the flower bloom. There are a lot of cropsies to collect in this level, but it shouldn’t be a bother. There is a lot of grass squares in this level, which boosts up the amount of cropsies you collect. You have to make a lot of droplets to collect and bloom flowers, but they’re easy to create so they aren’t a problem either.